One issue I ran into: I couldn’t reliably create a cover file, using Gimp, that would have the correct size in both inches and pixels. This post explains what I think the issue is; my cover how to page includes my advice on how to work around the issue. CreateSpace is an Amazon company devoted to print-on-demand services for indie publishers. We used CreateSpace to publish the paperback edition of Linda’s book. Gimp is an open source image editor that I used to create paperback cover experiments – Gimp is similar to Adobe Photoshop. CreateSpace requires that cover art be submitted in PDF format, and be a book-specific size. CreateSpace also has a cover template file generator, that produces .pdf and .png files you can use to create your book cover. PDF format gives the physical size of a bitmap (in fractional Points, which are 1/72″), the resolution in dots per inch, and the size of the image in pixels. So far, so good. PNG format gives the size in pixels of a bitmap, and can optionally express the X and Y pixels per meter: the resolution. Here is the problem I ran into: I could open Gimp, read the template .png file, edit a cover based on that file, and save the cover in PDF format… but the generated file, when imported back into Gimp, would sometimes be 1 pixel narrower than required. And what’s worse, I couldn’t seem to predict, for any given cover, whether that cover’s PDF file would be the right width! The cover art must be as wide as the front cover + your book’s spine + the back cover + a specified bleed width. Note that this means that the cover width depends on the number of pages in the book. For example, the spine of a 100 page book will be narrower than one for a 400 page book. The examples imply that the cover dimensions are rounded to 0.001 inches. The cover image must have a minimum resolution of 300 dots per inch. The cover image file to upload must have a maximum file size of 40 MB. x and y resolution of 300.000 pixels per inch. For Black & White books with White paper, multiply the page count by 0.002252” to calculate the spine width. In the play “Man of La Mancha”, Sancho Panza, Don Quixote’s side-kick, says “Whether the stone hits the pitcher or the pitcher hits the stone, it’s going to be bad for the pitcher.” We have a similar situation here: whether we calculate pixels from inches or inches from pixels, it’s going to be bad for the picture. Luckily, 2625 pixels / 300 pixels per inch = 8.750″ exactly. If you type a new physical width, the resolution value changes so that width * resolution = the image width in pixels. If you type a new physical height, the resolution value similarly changes. If, on the other hand, you type a new resolution, the physical dimensions change so that, again, width * resolution = the image width in pixels, and similarly the height * resolution = the image height in pixels. Further, it seems that – at least for Gimp version 2.8.22 – when I even click on one of the fields in the Print Size or Scale Image dialogs, Gimp recalculates the other fields as if I’d changed the field I clicked on. All this would be a bit academic, except that CreateSpace requires a PDF-format cover; not a .png format cover. So the image size can be distorted a little in the translation between .png and .pdf, losing a pixel of width. Start from the CreateSpace-generated template .png file, which (I believe) has the correct, though inconsistent, size in pixels and resolution. That is, don’t create a Gimp cover image from scratch, and don’t start from the PDF template. Never click OK in the Print Size, Canvas Size, or Scale Image dialogs, because doing so will change either the physical dimensions or resolution in the exported PDF. My page on Creating Your CreateSpace Cover Using Gimp incorporates what I’ve learned into a set of step-by-step instructions for a (hopefully) successful cover-creation experience. 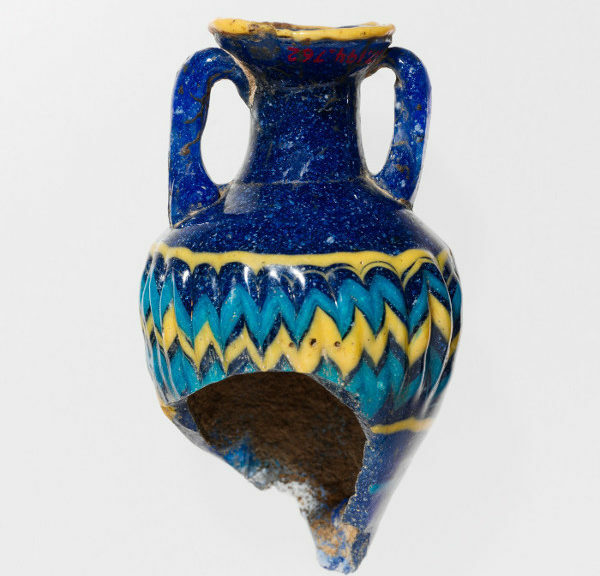 Featured Image: Glass amphoriskos (perfume bottle), late 6th–5th century B.C. Public domain image courtesy of the Metropolitan Museum of Art.